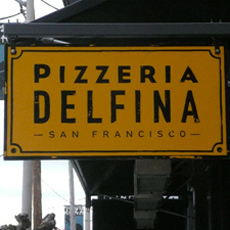 The food at Pizzeria Delfina is inspired by Craig Stoll's memories of New York-style pies from his youth and pizza from the best pizzerias of Naples. The menu features six Neapolitan inspired, thin crust pizzas and two daily-changing special pies and a "piatto del giorno" from the oven. The food is Italian in spirit, using local, seasonal ingredients.